Nancy received her MFA from the University of Florida, in Gainesville Fl. She earned her BA at Humboldt State University, in Arcata Ca. She Coordinated the Ceramics programs at the Mendocino Art Center, and Colorado Mountain College, in Aspen Co. She lived in Northern China for three years where she taught art classes at the International School of Tianjin, studied Chinese painting, and enjoyed a ceramic residency at The Pottery Workshop in Jingdezhen. She has been an artist in residence at The Mendocino Art Center, and the Carbondale Clay Center. 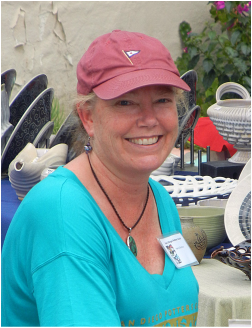 Nancy is a member of the San Diego Potters Guild and creates her work at their studio in Spanish Village, in Balboa Park. She is excited to be living in the city where she grew up. My current work reflects my interest in birds and flowers. I live close to the ocean, on the edge of a tidal estuary where I walk among flowering native plants, grasses, birds and waterways. A constantly shifting landscape, full of water at high tide, and empty of it at low tide. A world in constant motion, pausing, I catch a glimpse and then it changes. It is amazing to be surrounded by so much natural beauty in a soft, mild climate that stimulates constant growth and abundance.